Disclaimer: The product is a door gift given by Crabtree and Evelyn during their opening store in Pavilion. If you haven't read about it, feel free to read them HERE. The review is written based on personal opinion and experience. Since my Baby Johnsons body lotion finished, I have no choice but to start using this body cream from Crabtree & Evelyn. Unlike any other body lotion, this is very bulky and I meant the weight. The box packaging looks vintage with roses design. The mixture of gold and pink colors portrays an elegant yet lovely feel. Massage the body cream into the skin to achieve a soft and supple skin. It is perfect for areas that need extra care and hydration, or any time for scented and silky smooth skin. I love the whole packaging especially the gold cover with a rose engraved icon. It brings out the premium yet lovely feel of the products on Evelyn Rose series. Uncover it, has this white texture lotion. It has this thick and milky texture when you apply on the skin. The best thing of all is, it has a super nice rose smell! You have no idea how much I love the roses smell. The light fragrance delighted me most of time whenever I put it on. 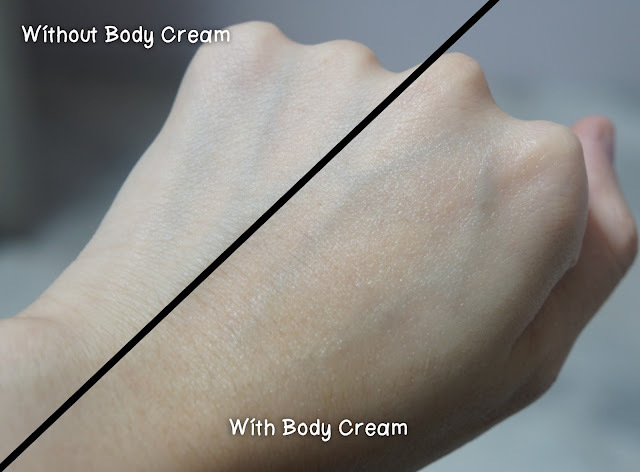 The right side with the body cream actually looks drier than the left part lol. Well, if you see it with bare eyes, the hand is actually moisturised after I put on the body cream. However, it seems to be a little dry after some time. That is one of the reason I would not repurchase it. I prefer something to be wet I guess? Still, even after the you apply it on the day and come back home at night, the rosy smell is still there! I am pretty impressed with it because of the long-lasting smell; even perfume could not last for such a long time. Repurchase: I might repurchase it if I haven't discover any new body lotion yet. It might be a little pricey but I love the long-lasting smell. As for the moisture level, this is better than my previous body lotion (Johnson Baby Lotion). So it is a 50-50 for me to repurchase this product.